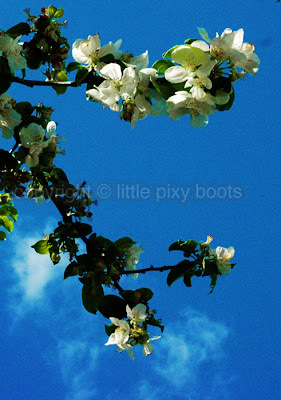 Apple blossoms are the soothing balm to my disappointment of not catching the cherry blossoms this year in my garden. 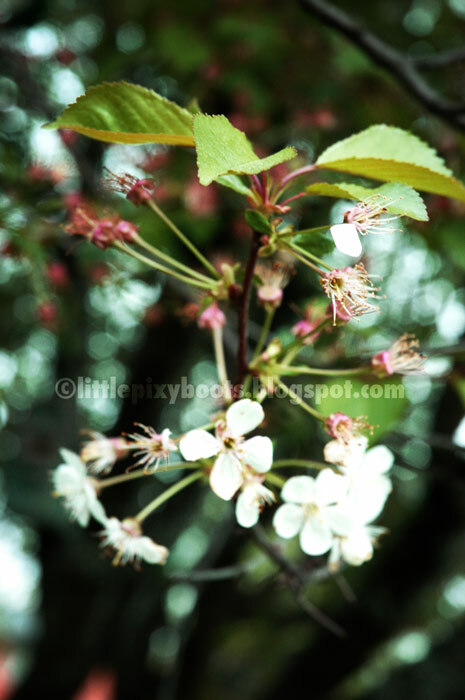 I was in Singapore and came back only to see the cherry blossoms "snowing" their petals onto the grass. 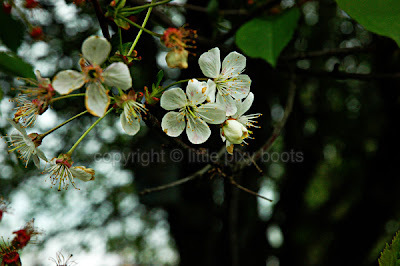 Apple blossoms look almost like cherry blossoms, except perhaps the latter is pinker in the flower centres. These cherry blossoms, or sakura, look almost transparent. Aren't they beautiful? I just realised that the "fruit buds" grow from the centre while they shed their... "pistols". Erm, this is clear evidence that Biology has been washed out of my brain to the drain. Sorry, Miss Leong. 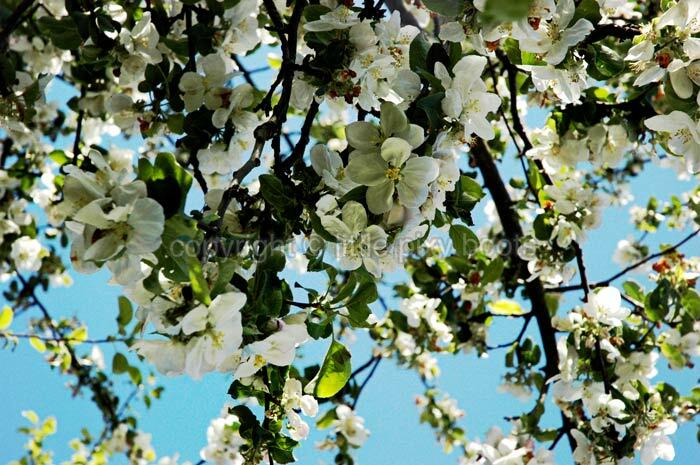 The view under the apple blossoms are fantastic. Pity I can't sit under it and picnic like the Japanese do during hanami, the cherry blossom season. It is my dream to visit Japan, travelling from the south to the north to catch the cherry blossoms blooming in different Japanese cities, as the flowers open first in the south, then upwards towards the north. 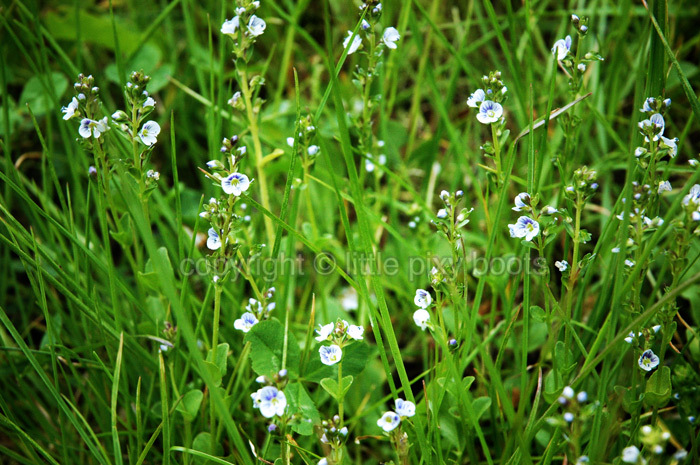 I don't know the name of this pretty blue grass flower, but they are so dainty and beautiful. Pity I have to mow them down when the grass is too long. They are really hard to save, so I captured them with my camera. This rhubarb bush is trying to dominate the garden. 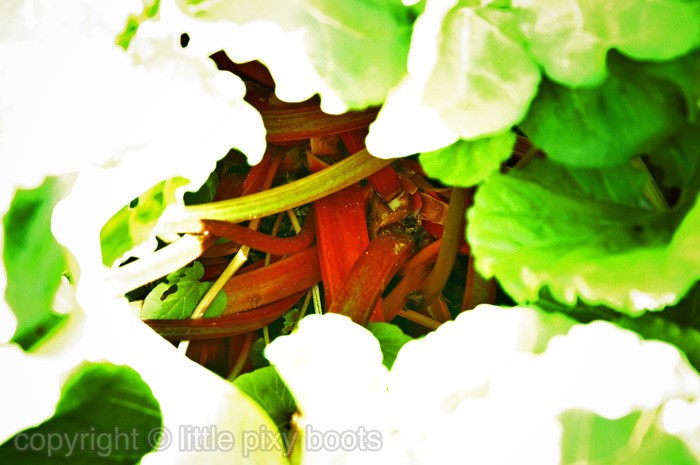 First to bud and blossom in spring, last to shed before winter, the rhubarb is one of the hardiest plants I've observed. Mr Rocky Rhubarb thinks he's the king of the garden, growing fast and furious. Yes, I admit out of ignorance, I've been throwing them away because they grow too fast for us to eat. Perhaps now I can make them into a jam instead, but it's a lot of work to peel the stalks one by one and then cut them up. But they pretty much cook themselves if you just put in a little water and leave the pot covered for 20 min on medium heat. I added some apples too, sugar and nutmeg. 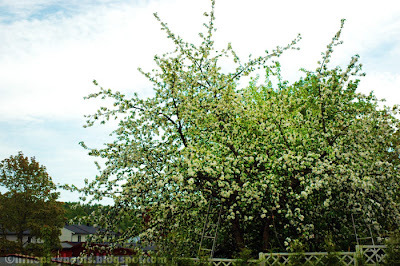 The flowers grew up so massive that they were even taller than me. I had to cut them off, according to my mum-in-law, because they took too much energy from Rocky. I took pictures before I used a saw on them. Look, it's even higher than our garage roof! 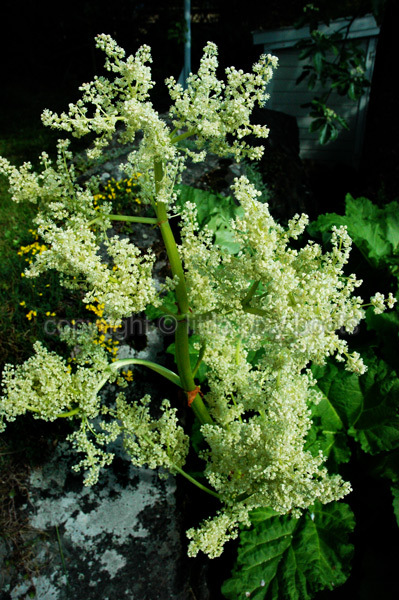 We had two rhubarb flower stalks like this. 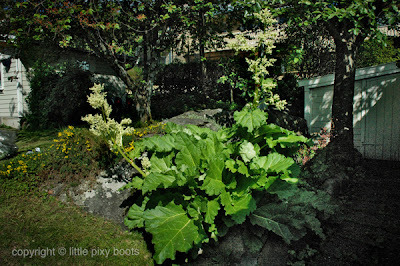 Rocky Rhubarb's stalks are hidden under the gigantic leaves, which are supposedly poisonous. Apparently he has the same ancestry as mine - China! 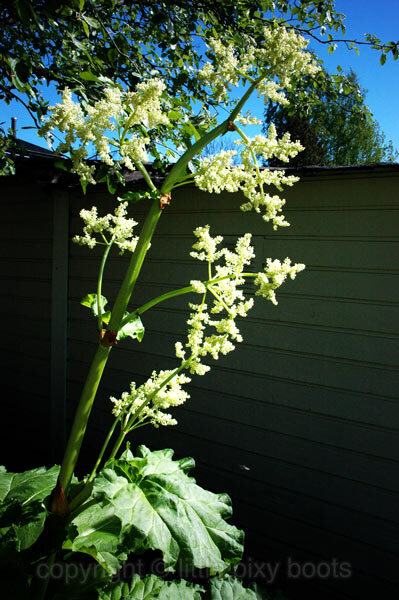 Stalks are used as a medicinal herb in Chinese medicine. 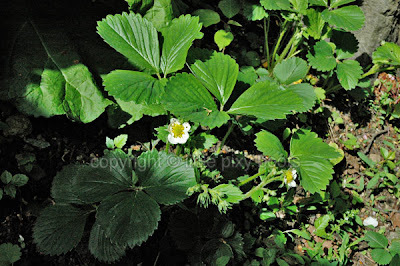 Most stalks are red, although some big ones can be light green too. 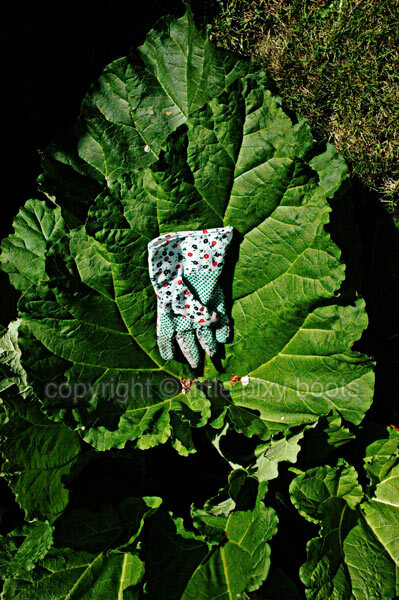 Rhubarb leaf versus garden glove. Leaf wins. This leaf + stalk reminds me of those ancient Chinese fabric fans used by pretty serving ladies to fan the emperors of Chinese dynasties. That's the reward the emperors get sitting on their thrones. 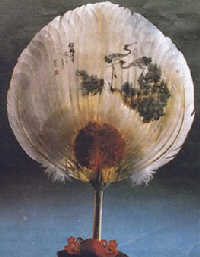 They get fanned all the time (at least in the ancient Chinese tv soap operas), with fans that are a bigger version of these babies. By trimming the rhubarb leaves, I was hoping to give my wild strawberries (living next door to Mr. Rocky Rhubarb) a chance to grow bigger. There they are, my little Strawberry-Shortcakes! Aren't they adorable? 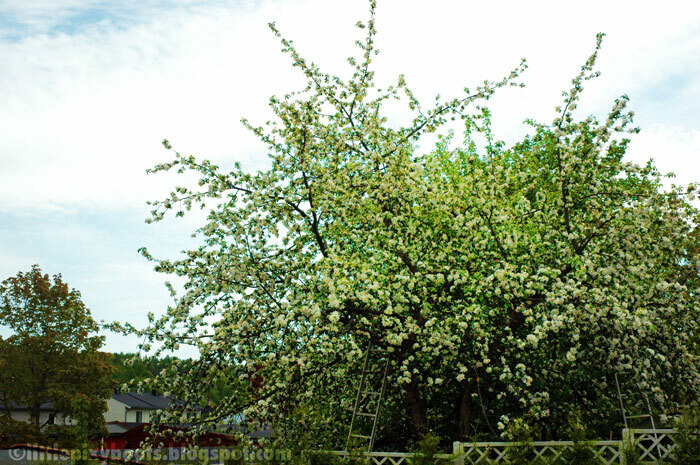 Ah, I love spring time in Norway. Thanks :) I do try to observe everything I see and write it down like a diary.